This shall lead to a clean fuel which results in a better combustion and lowers the fuel consumption and combustion. Tests with KleenFuel has given results from 5% to 17% fuel savings. 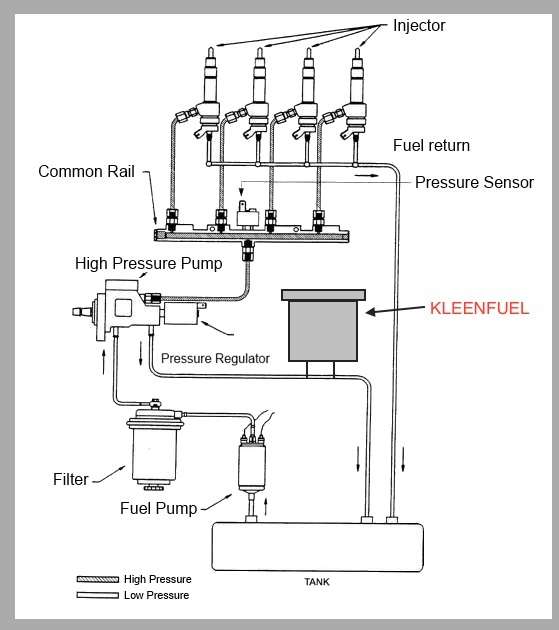 In the same way Kleenoil Filtration Units operates on a by pass oil system, KleenFuel has found a safe point on the fuel system where it can circulate the filtration of fuel. Cleaning down to 3 micron absolute (1 micron relative) and removing all water as it is formed into the diesel fuel. Commercial engines have components which has tolerances between the moving parts of 3 – 4 micron. Standard inline fuel filtration generally cleans out all particulate over 25 micron. KleenFuel cleans up to 1 micron (relative) 3 micron (absolute). Simple install the KleenFuel KFD65 in the return line of the diesel fuel. In this case, their are no effects on the motor. The management system can do it’s work as it has been designed. With the KFDC65 premium split cartridge contamination will be removed from the fuel and protect the injectors, common rail system and other components against wear, soot, sludge, etc. KleenFuel elements have a double-acting function: absorb water and filter contamination from the fuel. By removing these components from your fuel, combustion will be improved. Wear and damage to fuel system components are caused by the particles of about 3-15 micrometers. KleenFuel elements filtrate up to 1 μm to reduce the risks of wear. KleenFuel elements remove water upto 0.05%. This will reduce the forming of bacterial growth and oxidirapidly wear and oxidize engine components causing rusting and corrosion resulting in Injection damage and size. The filtration system of KleenFuel removes dirt, contaminants, wear particles and water, it does not remove fuel additives necessary for continued use. The unique aspect of Kleenfuel is its installation point. upset the ECU and cause a number of problems in the fine tuning of a modern engine. Installing Kleenoil at this point is feasible by reducing the restriction, but from a sales perspective it is not ideal. Remember Common rail engines return 90% uncombusted fuel to tank ? Kleenfuel install on the return line of the common rail to tank. On the top of any fuel tank is a sender unit. Raised arrows indicate feed and return. The Kleenfuel is mounted in a suitable location as close to tank as possible. Clear pipes are used here to illustrate the connection. Once a mount position is identified, install can take around 20 mins with minimum amount of tools. There is usually no interference with the engine. – Change at the end of the first week the cartridge, this rids the system of the inherent dirt prior to KleenFuel. – Cartridge change interval advise is minimum 3 monthly or on the customers inspection / service interval. – The greater the changes the better the efficiency!